In seed-bearing plants, a seed is the end product of sexual reproduction. It is a mature ovule , comprising an embryo or miniature plant along with food reserves, all within a protective seed coat. Seed plants first appeared during the Devonian period some 400 million years ago and rapidly became the dominant vegetation. Up to that point, plants relied on spores for dispersal and were heavily dependent on water for reproduction. 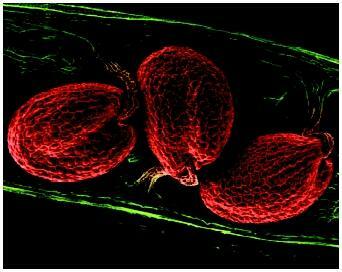 A scanning electron micrograph image of Arabidopsis seed pods. Seeds develop by fertilization of ovules, both the exposed ovules of gymnosperms like the conifers and the enclosed ovules of the angiosperms (flowering plants). The seeds of gymnosperms are virtually naked and exposed to the elements, whereas those of the flowering plant develop within a protective structure: the fruit. In both groups, the egg within the ovule is fertilized by a male nucleus arriving via a pollen grain. From this, a miniature plant or embryo develops that will later resume development in a process termed "germination," utilizing energy stores laid down in the seed. Flowering plants differ from gymnosperms in that seed development in angiosperms starts with double fertilization. Male and female gametes fuse to form the diploid zygote , which develops into the embryo, while a second male nucleus fuses with two other nuclei of the ovule to give rise to a triploid endosperm . The endosperm is a nutritive tissue that provides food material for the developing embryo. In some flowering plant seeds it remains throughout seed development, storing the reserves that the embryo will require for germination. Such endospermic seeds are produced by cereals like wheat, as well as dicotyledonous plants like castor bean. In nonendospermic seeds the endosperm virtually disappears, all the food reserves being transferred during seed development to the embryo itself. In such seeds, the cotyledons or first seed leaves become quite large and accumulate the reserves that will be mobilized later in germination. Reserves may take the form of intracellular oil droplets (for example, the sunflower), protein bodies (beans), and starch grains (cereals), or combinations of these. Some seeds also store polysaccharide reserves as massively thickened cell walls (some leguminous plants and date palm) that will later be hydrolyzed . The exception to this general pattern is the family of flowering plants known as orchids. They produce the smallest seeds known. These dustlike seeds contain just a few cells, often not even organized into a recognizable embryo, and contain absolutely no food reserves. Their germination relies on symbiotic associations with fungi to provide the fuel for germination. Seeds often exhibit dormancy, meaning they fail to germinate even when provided with adequate water and suitable temperature conditions. Dormancy acts to prevent germination until conditions are right. This dormancy may be broken by proper exposure to light or darkness. Alternatively, a hard seed coat may physically prevent water uptake and embryo expansion or even gas exchange, with germination only proceeding following physical damage to the seed coat. Last, chemical inhibitors present in the seed may cause dormancy, and these must first leach out into the soil before germination can take place. Seeds of crop plants can often be stored for years under cold, dry conditions, and some plants show extreme seed longevity under natural conditions (for example, the sacred lotus germinates after hundreds of years buried in lake mud). Kaufman, Peter B., et al. Plants: Their Biology and Importance. New York: Harper & Row Publishers, 1989. When is a set of seeds enclosed like a pea seed, called a pod?